What is it about the Welsh dresser that appeals to us? "Why do we respond so emotionally to this one item? For starters, the Welsh dresser conjures up a romantic image of a simpler life more than two hundred years ago.... "
"a farmer’s cottage in Wales with a peat fire burning in the open hearth, a baby asleep in the cradle nearby, the husband sitting on a stool by a table finishing his gruel for breakfast while the wife stands before her high oak cupboard polishing every bit of pewter until it shines like silver, then rubbing the wood with beeswax to a fine patina." 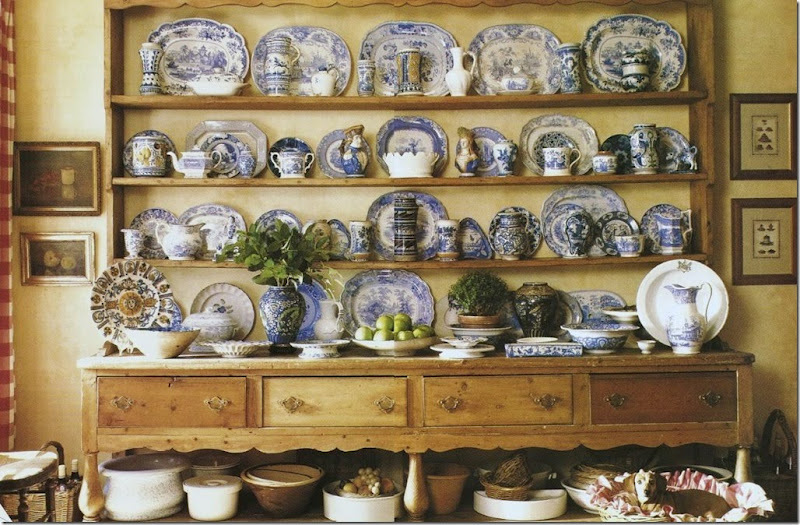 Carol Glasser's Welsh dresser (above) has inspired me for years. I'll never forget the first time I saw it in a magazine years ago. It spoke to me and I realized that it was precisely the kind of display that I wanted for my dish collection. I did not want my dishes behind glass! I can't remember if I already had my pine Welsh dresser, or if seeing hers inspired me to find one of my own. I have had this dresser for 20 years. It is a married piece, which contributes to the rusticness of it. It is fun to change up the dishes on display, depending on the season or holiday. I like to think about the history of this piece. Where did it come from? I hope Wales, where our son-in-law is from. Secret: there is a pipe carved into the top of the hutch, signifying who the cabinet maker was. Kind of like his trademark. The Welsh dresser at home was a birthday gift from Mr. A. It is a little finer that the pine one, but still quite rustic, due to the painted back. There are carved acorns on it. I was told it came from Wales. But maybe not. "Welsh" dresser is a misnomer as these were made in England, Scotland and Wales. The Welsh pieces were more elaborate, while the English pieces were more simple. Perhaps my pine dresser is English and my oak one is Welsh. Either way, they most certainly conjure up images of a simpler, romantic time. Wales was a poor country, so these cupboards were made to hold everything from food preparation to storage in the kitchen/diningroom/livingroom. The top of the dresser displayed the family's prized pewter or china, while underneath, the mixing bowls and serving pieces were stored. 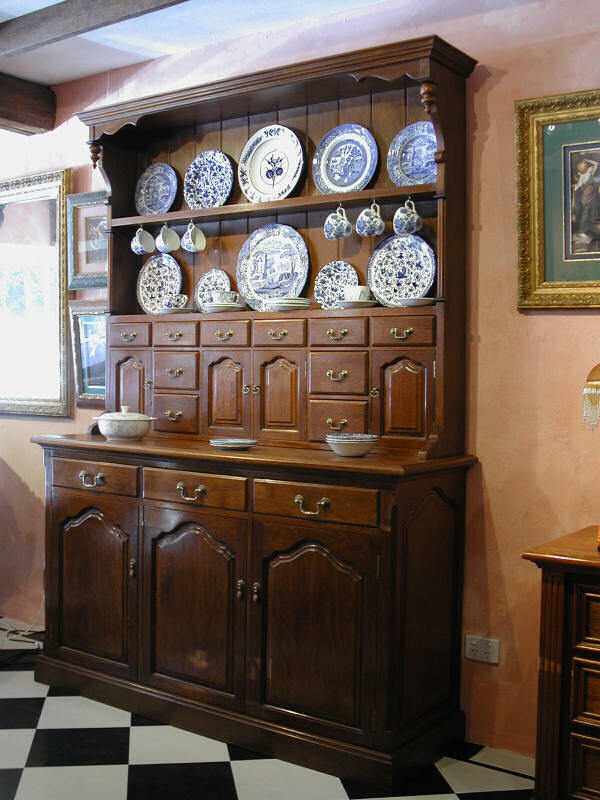 The Welsh dresser was made with whatever wood was available. Pine, elm, but most were oak. No two were ever alike. I look forward to visiting Wales someday. Top on the list of places to visit will be the Museum of Welsh Life, just outside of Cardiff. It's a living museum with cottages scattered amongst the gardens, each with Welsh dressers and other antiques from the 17th century. I love your cupboards. I especially love the detail of the pipe which is the maker's mark. I don't have a Welsh cupboard but I definitely feel drawn to the look also. I have an early 19th Century Dutch Bombe Wardrobe. It is missing the doors but that's okay because I love the open shelves for decorating. Thanks for the inspiration! My father's father was Welsh and I've been fascinated by that country for years. And I just LOVE Welsh dressers.. Thank you for such a wonderful display of them! Gorgeous furniture and treasures to look at! Delores, each one of these makes my heart sing. Both of your dressers are wonderful pieces,and they are filled with yummy dishes. Love the majolica with the plaid! 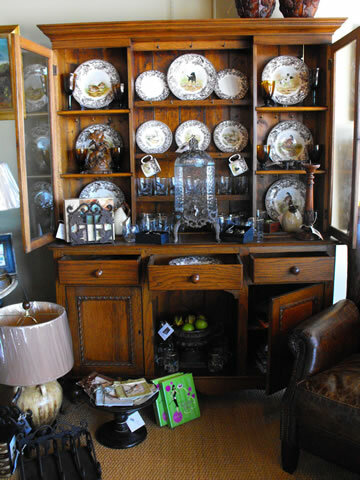 We have a Welsh dresser in our dining room and a glass front Irishpine cabinet in our breakfast room. I agree with you. I like the open shelves rather than the glass doors. Welsh Dressers have always been a favorite of mine. Richard Cottrell (My Old Historic House blog) had one in his shop two or three years ago. I think about that dresser a lot and wish I had it here in our home! I love welsh dressers..so beautiful..my open hutch is full of my favorite dishes I change out seasonally, I am sure it's inspiration is from the lovely antiques you have shown. I love your rustic dresser with the green back. Gorgeous piece and so beautifully arranged! Really pretty and amazing plate collections. 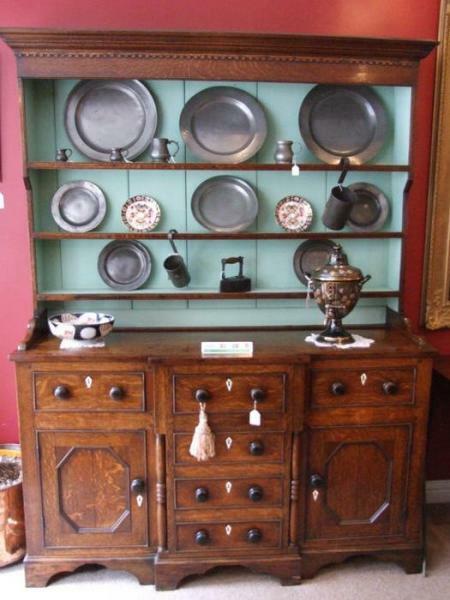 I have been on the hunt for a welsh dresser for years. They are hard to come by in my area it seems. If I do find one, it usually is a little out of my price range. In the mean time, I'll just enjoy admiring yours from time to time. Thanks for this beautiful post. I have longed for one of these, as long as I have been aware of what they were. The only ones I have found are so large that they would not fit into any house I have had since the discovery. I wonder if they were always so large. Either way, I don't think they are available any longer. I've had my dresser for thirty years. I love it. It's 7' long (the big ones are cheaper b/c everyone wants the 4' ones). Earthquakes are not a problem if one takes some precautions. All the plates are held in place by L-hooks (relatively invisible). Any loose pieces are held down with quake wax / museum wax. My kids call ours the "earthquake detector" b/c if we're not sure if that was a quake we just felt, we just check the cups on their hooks on the dresser. If they're gently swaying, it was a quake.